(1) Dosage is the poison. Just because a chemical (remember everything is made from chemicals) is in a food item doesn’t mean that particular chemical is poison. If you use that analogy then water (hydrogen and oxygen) is poisonous. If you drink too much water, it will kill you. The dosage makes the poison, not the chemical itself. And . . . your statement that if you can’t pronounce a name, it must be bad for you. 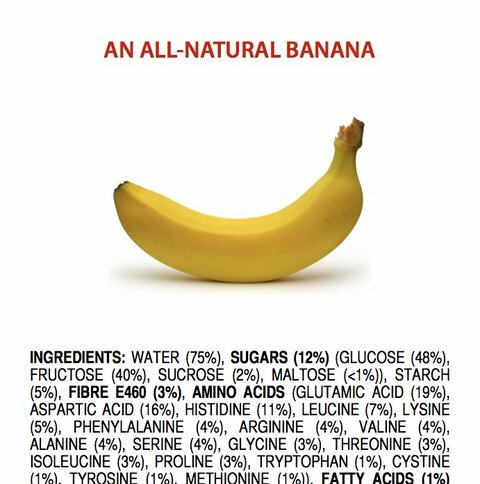 Do you know the ingredient list of a banana (noted in graphic)? Can you pronounce all of these names? Probably not. But with your analogy, bananas are bad for us. You take advantage of consumers’ chemical illiteracy and make false claims. The result? Unnecessary fear. One of your most notable “finds” was a chemical found in yoga mats is also in Subway’s bread. It is common for different chemicals to be used in many unrelated products/foods. Refer to #1 – Again, Everything is made of chemicals. Companies have a brand to protect and having any negative (even if it’s not true) attention can be detrimental to their company. Let’s face it, companies fear you because of the bad press you can give them, even if your claims are outright untrue. It may feel good to have that power, but it’s just unethical and at times mean spirited. (3) I wish you knew more about science. Please consider taking some classes or better yet, learn and ask questions from scientists. Don’t ban them from your site, which you do. Have a conversation and enlighten yourself with these scientists. And share this information with your followers. And speaking of science, doesn’t it seem a bit hypocritical to embrace medical biotechnology advancements, but demonize the same biotechnology when we use it in food? Insulin, which is used by millions daily, is a genetically engineered substance. I hear absolutely zero protest about people using insulin. (4) I wish you knew more about factory farms. I wish you knew that “factory farms” are really family farms. 96% of so called “factory farms” are family owned. By asking your readers to boycott factory farms, you are asking them to boycott families who farm and care for animals every single day. Why do you feel it’s wrong for family farmers to use technology and improved efficiencies, which result in better care for their animals? (5) I wish you knew more about biotech. Yes, consumers should have choice. But to make a choice, consumers need facts so they can make up their own minds. Do you and your followers know that biotech crops go through a lot of “hurdles” before they are introduced to the market? Potential biotech crops go through rigorous testing and need to be approved by the FDA, EPA and USDA. It takes an average of 13-15 years and $136,000,000 for one seed to be market ready. (6) I wish you would stop banning people from your Facebook page. I know, it’s your very mission to not allow others in your “bubble world” if they don’t agree with you. But you are banning anyone who asks a legitimate question or disagrees with you. Let’s be honest. People want and deserve “both sides of the story.” By opening your Facebook page back up, your credibility will increase 10 fold. (7) I wish you would show respect for experts in the field of science. To mock well-known scientists that do not share your viewpoint results in your lack of credibility, especially since you don’t have the credentials to mock him. For you to say, “Will someone please explain what genetic modification is to this famous scientist?” to Neil deGrasse Tyson, really is a little crazy on your part. (8) I wish you knew that correlation does not mean causation. Again, this is a basic science fact. Enough said. (9) I wish you knew there is an increasing awareness of the growing business model you are creating that results in your monetary compensation for products you endorse. Yes, you are profiting by working with affiliate marketing companies that you promote on your site. (10) I wish you knew the benefit of connecting with farm women. Women who work with their animals and farms every day, women who work tirelessly raising and growing food for families, and frankly, women who you are directly and indirectly working against. I know, farmers are only 1-2% of the population so we are easy to ignore. But that makes us no less important. Believe me when I say, we have more in common than not. We may not be “Food Babes” but we are in our own way, “Farm Babes” who work tirelessly feeding families. Please reach out to us. I am married to a Dairy Farmer but I have nothing in common with Hani Vari . Sorry. Her fear-mongering arguments and ideas and her attitude together with the lack of scientific accuracy is downright disgusting. All for profit! The same profit she is so quick to judge evil when someone else is making the money. Thank you Alex! I am just tired of the fear mongering. Great work! Great article, I’ll be sharing. Do what’s right and watch dogs that actually care won’t have to “tell” the real story ~ there won’t be one to tell. Guess I am not really sure where you are going with this statement. Am I missing something? Fear mongering are the specialty of these “babes.” I feel sad that women have to use their “babe-ness” to get attention. How about a little intelligence and facts for once? I guess it’s too hard for the likes of the Food Babe and the Babes Against Biotech. Excellent! Thank you for taking the time and having the patience to write this. Sharing! love this – well done fellow Ag Sista! This is fantastic!! Thank you! We are all too accepting of others’ “opinion” as factual science rather than truly understanding, or having the ability to research, what is accurate for ourselves! Nutrition is a Science, which also incorporates the study of agriculture, and is always evolving! Thank you, thank you, thank you! I love this! I don’t know who the FoodBabe is, but the arguments are the same for every fear mongering, anti GMO group. Anyone who thinks toxic chemicals are comparable to the chemical composition of a banana does not know anything about chemistry. And if one is naive enough to think the FDA only approves things that are good for you, you have not done your research. Scientists and Government agencies can be bought out. That a blogger gets paid for recommending products that she believes in is not unethical – it is how one continues to keep the blog going (simple accounting skills would make that perfectly clear). And many a great scientist was self-educated, with the only degrees they earned honorary (in other words, you don’t need a college degree to know something). So my question for this blogger is: Who is PAYING YOU for your comments about the Food Babe? And what is wrong with wanting true data about what is in the food we eat? I believe such data is a valid right of any person. That a person can think for themselves and not be swayed by other’s opinions, even those OPINIONS of bought-out scientists, is a positive trait in my book. Well, to set the record straight, I receive absolutely no pay or compensation for my blog. And I have no problem with wanting true data about what is in the food we eat. That is precisely why I blog, because she is not being truthful. She just wrote in the past couple day that 90% of Trader Joes meat could have antibiotics in it. Really? It is ILLEGAL to sell meat with antibiotics. This is purely fear mongering. And if she wasn’t afraid of the truth, why does she BLOCK EVERY SINGLE PERSON that asks a question or may not agree with her. I think it speaks volumes. It is not illegal to sell meat with antibiotics in it. Treating factory-farmed animals with antibiotics is standard practice. You should know that this gets into their bodies, and therefore the meat we consume. I disagree with you. We cannot sell meat that has antibiotics. We are required to strictly follow a drug withdrawal program to ensure all the drugs are gone from the animal’s bodies. Also remember that we have to buy the antibiotics. So why would we want to give them more than they need? This is disinformation. It is well understood that over dosing animals with antibiotics creates a larger and heavier animal. Not a healthier one. The profit motive exists and companies are not ethical by definition. We must force them to do the right thing, just like child labor practices, safety standards and all other immoral behavior. Food Babe is doing us a great service and you clearly have a hidden motive. With all due respect, there isn’t one thing you have written that is correct. And you think I have an agenda? What about her agenda where she refuses to speak with anyone that doesn’t agree with her. No conversation. None. That tells me a lot about her motives. She blocked me after I asked what her sources were and if she had practiced the scientific method. Yes, it doesn’t take much at all for her to block you. She has her own little bubble. The burden of proof is on the GMO manufacturer, not nature. The neurotoxic pesticides alone are reason enough to avoid GMOs. To say that changing a gene that is ingested and becomes part of us will not have long term effects, many that are tough to trace since its inception is far fetched and dangerous. Believe this or not, but we ingest pesticides all the time. Plants naturally produce pesticides that we ingest. We have been manipulating genes for many years. Insulin is a GMO. And can you send me the research link to neurotoxic pest ices that are being used with GMOs? Brendan, it has been well studied by scientists and doctors that many of the more commonly used pesticides in organic farming are FAR MORE HARMFUL than Glyphosate and other common pesticides used in modern farming. A prime example is Rotenone, which actually attacks the mitochondria in cells and has been linked to Parkinson’s Disease. Also, epidemiological studies have not found associations between long-term low-level exposure to Glyphosate and any disease. Additionally, when it comes to your point about a gene sequence, the author already addresses that. GMO crops go through some of the most rigorous testing and analysis around and require the approval from the EPA, USDA, and FDA. To put this into perspective, pharmaceuticals ONLY require the approval of the FDA to go to market. Additionally, you fail to mention crops that go through selective breeding to modify their gene traits. Gene modification through selective breeding is imprecise and can bring about changes in a plant’s genes that are unwanted. With modern genetic modification, scientists and engineers are able to actually pin-point the gene sequence they want to modify, and ONLY that gene sequence. It is very precise and accurate. Yes, changing a genetic structure does change a crop, but scientists know what changes they are making and they do extensive testing to be sure all changes in a plant’s behavior are the desired changes. With the mutations that occur in selective breeding, we cannot be entirely sure because environmental factors can impact the breeding and we do not know exactly what genes are being passed. Yes, she’s creating her own little bubble. Is there a scientific reason that by simply eliminating chemical filled processed foods from my diet (no exercise, no supplements), I lost 50 lbs of fat in 18 months? I think there might be. And for the record, if you are a farmer using gmo seeds, then YES, you are being paid by Monsanto or another gmo seed producer. And calling these factory farms “family owned” is like calling Walmart a “family owned” business. Technically, they are. Take a look at the people who sit on the FDA and USDA and where they are also employed. And by the way, if food was clean, we wouldn’t need genetically engineered insulin in the first place. There is a reason that the commercialized part of the worlds population is sicker and fatter than that of the rest of the world. You don’t need a degree to find the factories that polite air and water, AND Food, only eyes. Alan, I guess I don’t quite understand your reasoning that we are being paid by Monsanto. We don’t have to buy GMO seed. We choose to because of the benefits for us and the environment. We receive absolute no pay from Monsanto, although, it would be nice because commodity prices are quite low right now. Realize also that Monsanto is not the only business that sells GMO seeds. And I can also assure you that family farms are not even close to a Walmart business. The people that work on my farm are myself, my husband and one employee. Yes, some are bigger and some are smaller. 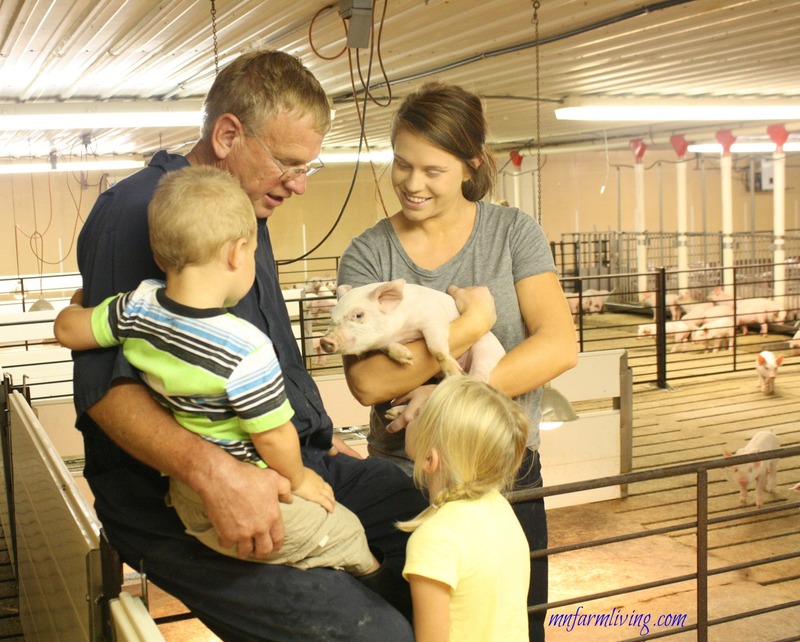 Typically the bigger farms have multiple family members involved. And as far as food choices go, no one forces anyone to eat processed food. It is your choice. And congratulations on your weight loss. Your good choices should not be forced on anyone else. And I would dare to differ you on the insulin. Many people are born with Type 1 diabetes which is not dependent on lifestyle choices and they are very insulin dependent. Thank you for the conversation and have a great day. Your response in particular stands out to me. prior to eliminating “chemical filled processed foods” from your diet, did you eat any freshly prepared foods, regardless of GMO, Conventional or Organic label? How about water? Seems to me, based on the little information you’ve provided, you were in fact not eating ‘food’ prior to making the changes. (and kudos to you for doing so!) You lost weight because you started eating REAL food. The issue with most ‘food’ today is that it is not actually FOOD. Rather it is “chemical filled processed food”. IF you want to be healthy and solve many of the modern day health ills, just eat UNPROCESSED, real food – you know as in fresh meats, seafood, veggie, some fruit, nuts, seeds and throw in a little bit of grains or rice and such. Regardless of the GMO, Conventional or Organic label this is far better for our bodies and for our communities. Thanks June for your comments. And I agree eating fresh food is good for all of us. Just remember, even our fresh food is made of chemicals. Everything is made of chemicals. And this is confusing for most people. Great post! I just shared with our Farm Bureau members of Kansas. I think we should invite Food Babe to some farms so she can she these factory farms in action. I bet she’d be surprise at just how not scary they are. Thanks Meagan! It’s pretty easy to scare people about their food when they’ve never been on a farm. Thank you thank you thank you!! Bravo!! The world needs more articles like this. Enough with the fear mongering and strait up MYTHS and insults to the people that actually work in agriculture! Yes. the food fear mongering needs to stop! One can protest factory farms without protesting “family” farms. The general connotation of a “factory farm” is one where animals are confined in very small spaces, with (tens or hundred of) thousands in a single barn with no access to natural light or fresh air, or pasture. That said, a family or a corporation can own a factory farm. Many are owned by families (often incorporated) and contracted to large corporations. Many are told how to run their operation by the contractor they are subcontracted to. Please see “Food Inc” as a single example of what I describe. It is these poorly run farms where animals are VERY poorly treated that we advocate boycotting. Herein lies the problem when using the word factory farm. In our barns, there is light that comes in through the fans. Fresh air is constantly blown in through the fans also. In regards to factory farms owned by family farms and then contracted to large corporations. We own our barns and pigs. The only contract we have is our commitment to sell our pigs to Hormel once they reach market weight. The only stipulation Hormel has over us is we need to use a certain genetics because their customers want a certain meat quality. We have guidelines in feed, because again, feed does affect meat quality. And lastly, they also require us to give our pigs high level of care. They only buy the best. We are required to follow all PQA animal care protocols. We are audited to make sure we are in compliance. For example, we cannot sell a pig that has a limp. This is why we give them the absolute best care. Understand that Food Inc is not based on factual information. While there are good points in this documentary, there is a lot of misinformation. And is not a correct portrayal of farms. Animals are Not treated poorly. There is no purpose in treating them poorly. That’s why people use the word factory farm because it gives the exact image you are talking about. We give them clean air, clean water, protection from the environment and predators, individual medical attention, and feed nutrients specifically designed for their needs. We are in the barns multiple times a day tending to their needs or just observing them to make sure they are not experiencing any problems. While I do hear your concerns (and I would be concerned also with what you have written) this simply is not the reality that I see on my farm or other farms where I live. I commend you for reaching out to a farmer. I would love to continue this conversation. Thank you for your comments. Thank you for this well written article. I too am a farm wife who is tired of my ill informed friends reposting this woman’s (could think of a better word) crap. Thanks Lynn! We just need to keep speaking up! In the end, I wish Food Babe would go away. We need to litigate against her or hold a congressional hearing as was done with Dr. Oz. She is accountable for a myriad of mistruths and must be punished now. I am concerned about the mess she will leave behind when she disappears from the public. You guys are too much. Really? Comparing natural God given foods to the stuff that created in labs? Water a poison because it’s in the amount consumed? Yes, that’s true to a point. But in reality it’s not even comparing apples with oranges. You compare apples with rocks and try to mis-steer the average reader. Give me the gifts of nature that come from God. Take your chemicals and keep them away from our food, soil, air, water, and living bodies. Nature provides all we need. Mankind takes those away. That is ungodly to the extreme. Jimmy, you do understand that everything is composed of chemicals. So if we take our chemicals, you wouldn’t have anything to eat. I think you have missed the whole point. Food Babe is the one steering you in the wrong direction. She misconstrues the truth and if anybody questions her, they are automatically banned from her site. That’s why you don’t see any questions. And you will notice I didn’t delete your comment, nor block you. It’s funny how everyone here who is criticizing this article asks you how much Monsanto is paying you. Never they mind that Food Babe is constantly shilling companies like Nutiva, et al, complete with trackback affiliate links so that she makes money if you buy anything from them. Nor do they acknowledge that corps like Whole Foods are more profitable than many of these GE companies. Big bubble. None of us get paid by Monsanto. Not one red cent. You must think everyone is a complete idiot. Of course everything is made up of chemical compounds, but NOT ARTIFICIAL COMPOUNDS THAT HAVE NO BUSINESS IN FOOD!!!!! IDIOT!!! There is a difference between NATURAL CHEMICAL COMPOSITION AND ARTIFICIAL COMPOSITION. WE DON’T NEED ARTIFICIAL CHEMICAL COMPOSITIONS IN OUR FOOD. Here’s the thing- it’s not about abandoning GMO, for some of us it’s about proceeding cautiously given we see a difference between GMO and Hybrid. quote from http://www.pbs.org/pov/hybrid/getinvolved_article.php “Environmental activist organizations, such as Greenpeace, argue that companies are putting profits over safety and are provoking unforeseen health, environmental, and socioeconomic consequences by tampering with corn genes. On the other side of the argument, the biotechnology industry, lead by companies such as Monsanto argue that GM foods are feeding a world population that is starving. They say that environmentalists and even the Environmental Protection Agency are overreacting. On average, it takes 10-13 years and $136,000,000 for a GMO product to come to market. The FDA, EPA and USDA all need to approve them. No other food item goes thought the same scrutiny as GMOs. Biotech is just one tool farmers use. And I feel reassured that scientists only change 1-3 genes out of tens of thousands of genes and they know everything there is to know about these specific genes. Does that mean we can quit researching. Absolutely not. But I feel through the science, research and knowledge they are safe to use. Thank you for writing and sharing this. I too have been banned from Food Babe’s Facebook page for questioning her credentials. I think the rise of these Internet sensations, educated at Google University, is a very dangerous trend. People can get hurt following her advice. A fine example of “A little misinformation is a dangerous thing.” Thanks for helping put the record straight. A lot of people don’t realise that “natural” and “chemical” are actually the same thing. Salt IS Sodium Chloride, Water IS Dihydrogen Monoxide, Vinegar IS Acetic Acid etc. It’s basic Grade ten chemistry. Eloquent and reasoned. Thank you for speaking out (and so politely!) against a fear-mongering attention seeker. I rarely comment on posts but I have to say thank you for writing this post and for responding to comments. It is so refreshing to see calm and compassionate dialogue. You share your experience and expertise in such a thoughtful way. I only wish certain people would read what you are saying and have an open mind. Thanks for taking the time to give us a more accurate picture of farming, biotech, and the regulatory process you deal with. Yes, Food Babe does have a small following because many people who have put her recommendations into practice have changed their lives around by making good food choices by using nonGMO, organic foods. Those with leaky gut, diabetes, inflammation problems…the list is ENDLESS, have gone on to have lives free for medication and trips to the doctor. You can slam her all you want but she has a following based on results. Even the large food corporations are coming around thanks to her advocacy and the American public refusing to eat poison. Thank you for your comments but I disagree. My blog post is based on facts and unfortunately, the Food Babe does not use facts. Greetings! I was directed to your post a few days ago. I appreciate your blog and your opinion… As I also appreciate Food Babe’s opinion. There is so much controversy and passion over GMO’s, but who is right? Is there some common ground on beliefs? I saw that you stated “On average, it takes 10-13 years and $136,000,000 for a GMO product to come to market. The FDA, EPA and USDA all need to approve them.” That’s probably true. But I’m guessing all those years and money are towards research and development in the efficacy of their seeds. I challenge you, or anyone for that matter, to show me where the time and money went for human research/studies. Can the folks that you buy your seeds from provide you with such data? If so, post it on your blog… There is your proof to shut down all the skeptics on GMO’s. That would truly put everyones mind at ease. I’ve been looking and have not found any human studies. That concerns me. I’ve only heard of studies done on mice. And the mice who were fed GMO’s had all sorts of tumors & other health issues. That’s enough for me to be alarmed & want to know more. This is from the Center for Science In The Public Interest: “There is no evidence at all that the current GE foods pose any risk to humans. The food-safety tests conducted by GE seed producers and others (but few independent scientists) have not found any evidence of harm or allergic reactions. FDA is responsible for the food safety of GE crops, while the USDA is responsible for ensuring that GE crops don’t harm agriculture or the environment. The EPA is responsible for the safety of pesticides, including plants such as Bt corn or Bt cotton, which have been engineered to produce a pesticide. Ok, so no evidence that there is a risk to humans. Again, where’s the evidence? Who ensures that GE crops can be safely eaten by humans or animals? BTW, the FDA also allows Glyphosate in 160 of our foods at levels .2 (berries) to 40 parts per million (oil). .1ppm has been shown to destroy gut bacteria! Gut bacteria is what we need to stay healthy and support our immune system. Just pointing out that if the FDA allows this, then who knows what it allows regarding GMO’s. And the USDA states that they have never allowed hormones or steroids to be used in poultry, pork, or goat products, so all of these products are hormone free whether they are labeled so or not. Really??? Now that is through their website. What do you all believe? As an example, take a look at a Costco chicken vs organic chicken. Has anyone seen the size difference? I think they hope we’re all stupid… I’ve bought Costco chicken for years. Especially because a pouch with two chicken breasts are so big, that it feeds my whole family. I cut those breasts down the middle and I’m left with 4 good sized breasts. I knew what I was eating. I made the choice. I recently chose not to buy that chicken anymore because of health issues. I totally respect what all farmers do and I understand that it is your livelihood. I’m just wondering if farmers who decided to use GMO’s had been given the research to make an educated decision before using it. One thing is to care, another is to look away. How did you know they are safe? What facts was your family given before investing in GMO’s? And out of curiosity, what if the company that sells you the seeds tells you there are no human studies, and the mice were all eventually sick and died. What then? The US has the highest rate of cancer compared to any country in the world. And according to the American Cancer Society, if you were to move to the US from another country, your likelihood of developing cancer increases four fold. 1 out of 2 men and 1 out of 3 women are expected to get cancer in their lifetime. 1 out of 8 women has breast cancer. But 1 in 10 of those breast cancers are genetic. Which means 9 out of the 10 are environmentally triggered. The US spends more on healthcare than any other country in the world. This outbreak of sickness and cancer seems to have taken off in the late 90’s. Coincidence? And now there is also an increase in allergies. That is a fact. More and more kids are now allergic to wheat, gluten, dairy, peanuts,etc. There is something like 25 million children with food intolerances (leaky gut) now & a 79% increase in Crohn’s Disease in the past 10 years. Cancer is #1 or #2 killer of children today. The problem is that I’m starting to feel like we don’t have a choice about eating. Especially when companies hide and won’t voluntarily disclose what’s in our food. Whether it’s GMO’s or other suspect ingredients. Shouldn’t we have the right to know? At least we should all be educated so that we can make the choice for ourselves to either buy GMO or organic. Although not everyone can afford organic. I bet that if enough people knew what GMO’s are, there would certainly be a huge movement. That movement would be called “Our Lives Matter”. Not everyone would necessarily be against it, I wouldn’t. As long as I knew what the longterm effects are. But this would affect their bottom line. We have to agree that it’s all about profits! Profit trumps the average Joe. As for Food Babe, she’s put into focus some ingredients that are questionable to ones health. Just because one is not medically trained doesn’t mean one hasn’t educated themselves though self study. Sometimes through self healing and family healing one might develop a deep passion in food. If she didn’t know what she was talking about, I think she’d be sued left and right. One has to have credible evidence and research to back up these type of claims. Because of her, I read that 120 unnecessary ingredients will be removed from Panerbread by the end of this year. I think that’s a win for everyone. Do you all want to be consuming ingredients that are unnecessary? This will not decrease their menu size or flavor profile. Also, it doesn’t bother me that she is being paid for all the time she puts into looking into questionable practices, ingredients, etc. Again, she put the info out there, it’s up to you to decide if that’s what you want to believe. And you can always research on your own what she claims. I think it’s fine to have someone advocating for stuff we don’t need in our food. If not her, or you, then who? Government & big corporations? Maybe, just maybe she’s on to something. I think we should all keep an open mind and instead of maybe wanting to leave negative remarks, ask “I want to know more! Where did you get your facts? or Who can I myself contact in regards to xyz?” Anyone will be defensive about something they truly believe. But we have to be willing to change our views and admit maybe we didn’t know enough or were wrong, especially if there is backing to it. I don’t agree she should exclude other peoples opinions though. Everyone should be given a chance to be heard! One thing is for sure, not one person knows it all. We all have to work collaboratively to keep each other well informed. It’s important to have an open dialogue, regardless of opinions. Thank you for your post and I look forward to your reply! “GMO foods have a long, safe track record (17 years in the marketplace). From their introduction in 1996 until now, scientists have found, through repeated and extensive testing, that GMO foods are no more risky than comparable non-GMO foods, nor do they differ in nutritional value. I would also like to ask you for your resource on glyphosate. I disagree with your assessment of foods that have used GMO technology. Cancer is terrible. My mother passed away from it this past April. But we can’t use correlation equals causation. As far as your issue with chemicals. All things are made of chemicals. But used in the context the Food Babe uses it, all chemicals are bad. Again, just as my blog post said, it is the dosage that is the poison. Hormones – it is ILLEGAL to give poultry and pork additional hormones. All living things have hormones but we cannot give these animals more. I am a pig farmer and I can assure you that we don’t. The reason chicken breasts are larger is because of nutrition and genetics. That’s it. USDA personnel are in all meat packing plants where they check meat for numerous issues, including hormones and antibiotics. While I don’t think we will agree on these issues, I appreciate the opportunity to discuss them. For more information about GMO technology, please refer to http://www.gmoanswers.com They have a large repository of information about the technology. It was long wasn’t it? lol. Thank you for your response! Thank you for including such names as Denneal Jamison-McClung. This gives me an idea of where you’re getting your reading from and I too can look her up and learn a few things for myself. I did google her and it took me to a site– GMO Answers. I read through several questions and answers. However, I did see that many of those questions, were answered by Product Protection and Nutrition Lead, and Scientific Outreach and Issues Management Lead of the Monsanto Company. It’s the very company that so many are skeptical of. So unfortunately, I don’t think this has put people’s concerns to rest yet. The nutritional concern is a good one, but I still want to know if there is a long term affect of the GMO’s which are genetically engineered to express the insecticidal proteins and those who express the enzyme phosphinothricin acetyltransferase, which confers tolerance to the herbicides. If you know more on this, please point me to the right direction. I’m really hoping to come across some studies and see the methodology. In the FDA’s site, I was reading up on some letters posted from consultants on the food from GE plant varieties. In one such letter, it addresses Syngenta Seeds, Inc.’s (Syngenta’s) consultation with the Food and Drug Administration (FDA) (Center for Food Safety and Applied Nutrition (CFSAN) and Center for Veterinary Medicine) on genetically engineered corn. Syngenta submitted to the FDA its summary of its safety and nutritional assessment of the genetically engineered corn. And the Office of Food Additive Safety, Center for Food Safety and Applied Nutrition concludes, “Based on the information Syngenta has presented to FDA, we have no further questions concerning food and feed derived from MZIR098 corn at this time. However, as you are aware, it is Syngenta’s continuing responsibility to ensure that foods marketed by the firm are safe, wholesome, and in compliance with all applicable legal and regulatory requirements. Should we be trusting the summaries of the seed developers for it’s safety? I think this should be done by someone other than the ones who have a stake on this. Just my opinion. The way the Bt trait and the herbicide resistant trait works is that it doesn’t do anything to systems that humans have. I have 2 articles I will share on that. So, there is NO impact on humans for that. As for long term, I would point to the trillion animal study (which I will give you the link to) that shows that farm animals have been eating GMO feed with those traits for 20 years and multiple generations with no problems. And another reason there have been no human studies is because absolutely nothing in their testing indicated they needed to do any human studies. In addition, foods naturally have genetically altered on their own and we don’t test those on humans. Good stuff! “Without chemicals life itself would be impossible.” – Monsanto ad tagline from a while back. Absolutely. Unfortunately, not many realize that! Do you get paid by Monsanto? I don’t follow or agree with everything Food Babe does/says but I take the time to research the topics myself. Why is it that sharing information is now fear mongering? You don’t think the US government, USDA, EPA, big pharmacy don’t fear mongering? Sally, no I do not get paid by Monsanto. I am a farmer. The biggest problem I have with the Food Babe is her “sharing information” is not truthful. Her background is computer programming, not nutrition. And she does not let anyone ask her questions on the claims she makes. And she has a lot of errors in her “sharing information.” But no one knows that because if someone has a question or doesn’t agree with her, they are banned from her site. She recently made a statement about farming that was completely wrong. I was not able to say anything about it because I have been banned. Many, many people are banned from her site. She is living in a bubble. Because food is such an emotional issue with people, good and respectful conversations are good for everyone. But not according to her world. Let me state, I don’t disagree with everything she says but there is a lot that is outright incorrect. Very fine article. I’m hoping for a groundswell of support for your cause. Vani unfortunately has popular appeal. She’s Julia Roberts in Erin Brokovich. Attractive, hard working, dragged up by her own boot straps, warm-hearted, a woman! She can take on the experts with that no-nonsense common sense approach. She’ll study the literature and emerge on the level of the best scientists able to beat them at their game — but using words that Joe Public can understand. Those scientists can’t fool her. Can’t hide their misdemeanors from her keen eye. And just like Erin, she’s hitting the celebrity and financial jackpot. She ignores the fact of a world destined for famine if we don’t take action. Astonishingly, with her Indian ancestry, she is able to ignore a continent where malnutrition results in severe health problems and where children still go hungry. You’d think she’d give a thought to that.